The Rebel Sweetheart. 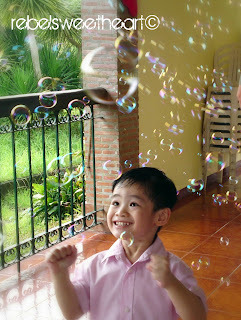 : Happy Bubbles. I love taking pictures. It's a penchant that goes way back to my UPLB days. After all, this was part and parcel of my college major. As such, I shall be posting photos from my portfolio - if ever I will really have one, LOL - from time to time. My son has been my most favorite subject when it comes to photographs. From the moment I gave birth to him, I always keep a camera close by. You have to be armed and ready to shoot for those fleeting milestones and Kodak moments. I guess that's the reason why Yue always looks so radiant in his photos. He's been smiling for the camera before he could even talk. As of late, this is my most favorite action photo of my little man. This was taken at last Saturday's luncheon after Maggie's Christening. And those are bubbles from the bubble machine provided by the party organizers. Couldn't agree with you more, sis. 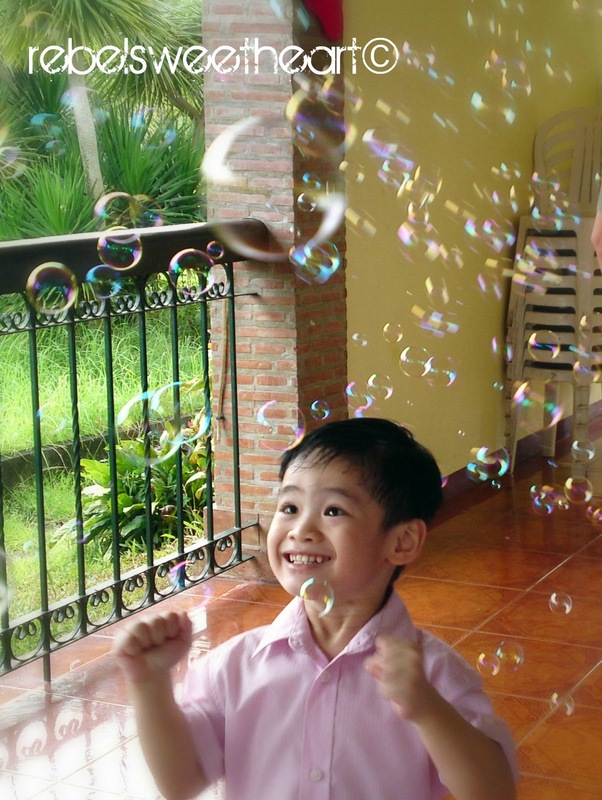 He really were enjoying and fascinated bythe bubbles all over him .He is so cute. Thanks for following my blog sis! Really appreciate it. I just read your post, and while it saddens me to hear about what happened, I really admire your strength to go on. awww he sure is having a great time blowing bubbles :-) so precious :-) Dropping some love for PF, hope that you can return the favor too. Hi Jessy! Returned the favor... added you up on GFC, too!